*As you search for the strength to fight your own battles, know that you aren't the only one suffering. We are each fighting our own unique war... and sometimes... a few good allies is all we need to win. *Love is about more than just a feeling. It's about putting that feeling into action. *Injustice gains strength with each silent voice and every inaction. And so, injustice holds the power... that we refuse to reclaim. *Complacency stems from indifference. Indifference says, 'Oh well.' Complacency says, 'It is what it is.' Thus, injustice is born... and hope dies. Now you know why... it is what it is. *When I think I can't go on, I just look at my rescue dog. If he can keep going after all he's been through... then I sure as hell can. *If you have even one person in your life who believes in you, and I mean truly believes in you, then consider yourself lucky. And if that one person... is you, then everything you believe... is possible. *If you care about something, but you won't fight for it... then you don't care. *We've all had bad things happen to us. All of us. But the outcome of your life isn't about what's happened to you. It's about how you chose to handle it. *You will never make everyone happy. But if you can make a few people smile often... then that's all you really need. *When you're a kid, anything is possible. You think big, you dream bigger, and you know--without a doubt-- that you can do anything. Over time, the world beats us down. The big thoughts are exchanged for conformity. The bigger dreams are traded for stability. The 'can-dos' are replaced with 'can't-dos.' We call that 'growing up.' But really... we didn't grow up at all. We gave up. I am just so in awe of you!! 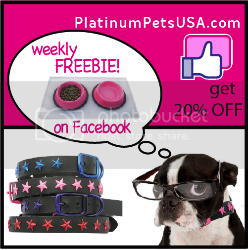 You do so much for all the fur babies and you lift us up with your word's of wisdom!! So true! You are very wise and do so much for the animal children who desperately need help! Ashley-You are such an inspiration! From all that you do for our sweet furry ones to the words that you share with us that so often inspire us to be and do half of what you do! Ashley, I'm twice your age yet you're my hero! Ashley, once again you hit it on the head, so true are all of these things that you remind us of.....truely motivational!!!! We've been suffering this week through the loss of our pittie...the first statement you wrote is so true. You never know what battle someone else is fighting and if we are all there for each other, it's the best possible thing we could do. Thank you for these words, Ashley! All ur thoughts are what many need to hear. We must stand for those who can't. I believe in a world where we can be anything, we must be ourselves. Ashley you are my inspiration, my dream life is the work you do and all you stand for. I will stand there with you. And today like any other, I feel blessed by who God surrounds me with. We all get caught up in our own "self" at times. And whether it be the eyes of the animals, the abuse of children, the conditions of the world, whatever it is that shows us our unselfish ways of contributing to more than our " self" them that is our sign from above to be who we are for God. We all can make a difference in the lives of many and change the world of that someone or creature. I feel to core that all creatures deserve a right to a good life and to know compassion, its our human responsiblity to see it is so. Colleen Byrd granitefalls NC. You are so wise beyond your years my little friend. I really can't thank you enough for that, I really needed to read that today Ashley and I think I will print that and put it in my purse to read over and over again. You are truly an inspiration to me and will always be an angel in my eyes. My posts never seem to post so don't know if they go to you or not. You have a gift of wisdom and words. I am new to your blog and don't even know how they all turned up on my facebook because I just have facebook to talk to my kids. I am wondering if you would share your life story up to now and explain what all you do and the outlets and connections you use. How do you reach others? Thanks. Ashley I was one of the many that felt sad because of what happened to our furry friends but never realy do nothing about it but because of you, now that I came to live to my home town I'm looking for a shelter to become a volunteer, all because you inspire me. Thanks Ashley for opening my eyes and take a stand for what I know I can contrubute to change. GOD BLESS YOU ALWAYS!!! Every time I read your blogs you give me new inspiration. You are such a wonderful person with a heart of gold!! 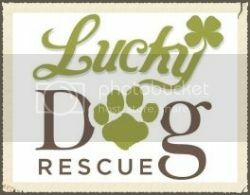 I thank GOD every day that I found you and Lucky Dog Rescue. Not just because I adopted the most wonderful and loving dog from you, but because you truly an angel. A person of your word and you don't let the world knock you down. You make me believe that things will change if scream loud enough.. long enough.. We just need to keep spreading the word and being the voices for the animals that can't fight for themselves. Not act is too small because every act of kindness go rewarded in another life saved.. one more animal that didn't die because someone stood up and said TODAY IS YOUR DAY TO LIVE, AND SOMEONE LOVES YOU!! Thank You for being my inspiration Ashley!! You are certainly one of the "most special" people in this world. 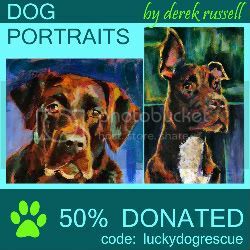 You humble me,and help me to not become complacent, not to give up,praying, advocating, donating whatever & whenever I can to abandoned pets! You are amazing! Thank You!! there's only one thing to say to you......you are simply fabulous!!!!! Love love it!! I have something to share soon!! 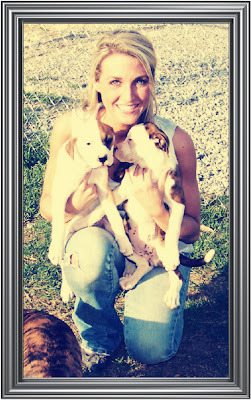 Looking forward to visiting Lucky Dog Rescue and doing some volunteer work with the pups!!!!! i was talking to my friend last night in facebook, i was told her in future i want to have my own rescue team. i always have a soft spot for the fur babies. and i want to help them the best that i can. and you inspired me a lot. i admire you and for me you're the real hero. GOD BLESS and im with you! My favorite: "If you care about something, but you won't fight for it... then you don't care." You can rescue. Or you can pull. Or you can transport. Or you can foster. Or you can adopt. Or you can Chip In. Or you can network for people who can do any (or all!) of the above. You can do something. BUT WILL YOU??? What a beautiful heart and sound mind you have! Thank you for all you do! God bless your work, your rescues, your lost ones, and YOUR life! You know you have so much wisdom to share with the world you should think to put all these together in a book for those people who don't have access to you via the internet. I look forward to your blogs every day. They REALLY make me think. Thank you for being you. Ashley, I am twice your age and I have fought for animals my entire life. I have suffered tremendous fallout for this, lost friends, been called names, etc., but I will NEVER give up the fight. So, your words "if you care about something, but won't fight for it... then you don't care." made me feel so much better. I hope you don't mind if I share that thought on my own FB profile. Thanks for all you do! Wow! I will be sharing these. They are all awesome. When I think I can't I will be reading them again & again. Thank you for all you do. Your words obviously come from the heart...and your motivation and strength are so admirable:)...I know I have said it before but you are doing what many could do but don't...thank-you! "If you care about something, but you won't fight for it... then you don't care" -- so true. I needed to hear that this morning, reminds me that I am on the right track! Thank you! That last quote is AWESOME. You are an amazing lady. Keep it coming. This article was really nicely created, and it also consists of numerous helpful details. I valued your expert manner of writing this article. You’ve made it is easy for me to understand. You are truly an angel on earth, I admire you so much! Thank God for you! just want to say thanks for all our 4-legged friends that can't. keep up the great work u do! Wonderful words of wisdom.....I will definitely share them. Keep up the good work you are doing for the animals. I LOVED all your quotes, Ashley! So glad you are a VOICE and CRUSADER for our Animal Buddies! Happy Thanksgiving! Many Blessings to you & yours!